Welcome to a busy new year already in the campaign for homes. The Housing Act is still stalled, with no move yet to pass the necessary regulations needed. Government have dropped the threatened Pay to Stay tenant tax, and postponed further Right to buy and sell off of council homes for at least a year. But the Act remains a threat, until we get it all scrapped. Ministers still want to end secure tenancies, and replace homes for rent with un-affordable mortgages. A new Housing white paper is on the way, so now is the time to demand policies to control rents and secure homes for all. Unite Offices, 128 Theobalds Rd London WC1X 8TN. We’ll catch up with plans, and welcome new ideas. All invited – email any reports or suggestions if you can’t make it. With a Q&A and discussion with the film makers and activists. Genesis Cinema 93-95 Mile End Rd, London E1 4UJ. 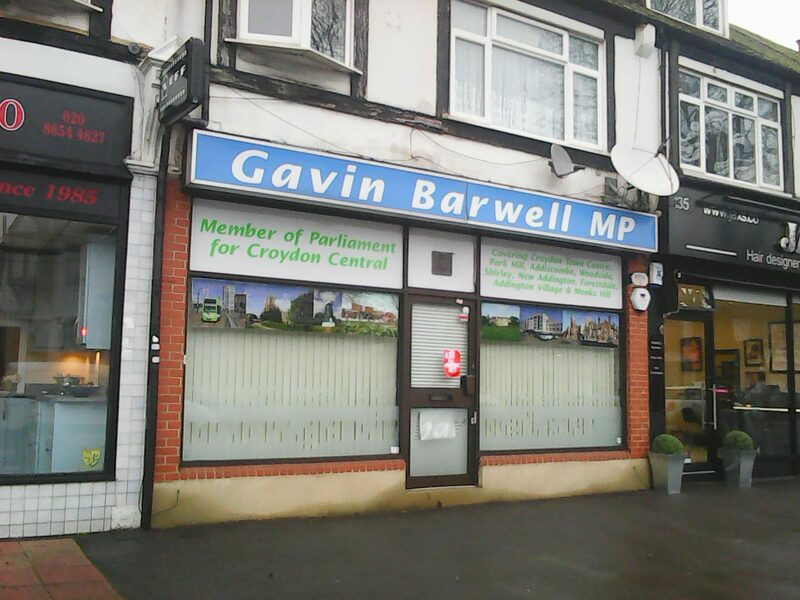 Thanks for a great local response to our stall in Croydon last weekend – Axe The Housing Act will continue to build pressure on Housing Minister Gavin Barwell to axe this act once and for all. One year ago, Axe the Housing Act (formally Kill The Housing Bill) was started by campaigners galvanised to stop the Conservative Governments Housing and Planning Act – and today we are in a confident mood. 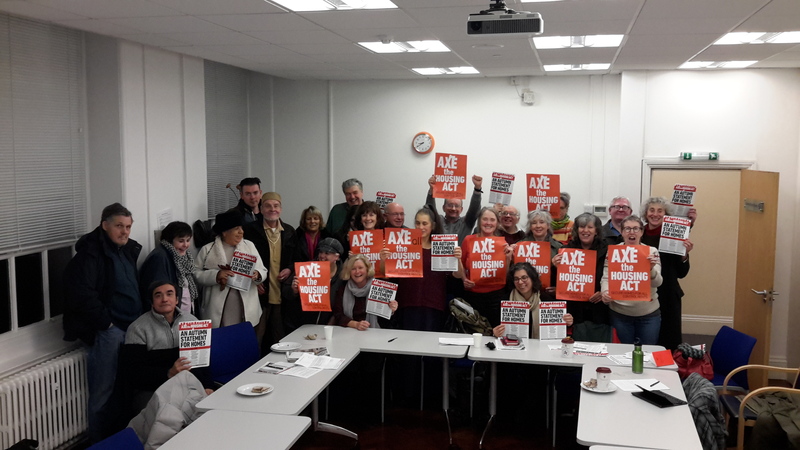 At a lively organising meeting this week we cheered the government backing off key parts of the Housing & Planning Act, and are now more determined than ever to campaign to scrap the whole Act. The Act is still stalled. None of the secondary regulations or commencement proceedings have started. The compulsory Pay to Stay tenant tax is scrapped, extending Right to Buy to housing associations, and the levy of funds to pay for it by market sale of council homes, are delayed for at least a year. Other parts of the Act are also in doubt. But Housing minister Gavin Barwell still wants to scrap lifetime secure tenancies for council and housing association tenancies. Plans include contacting all councils and housing associations to push for wider action, organise events in Kent, South Yorkshire and Liverpool/Manchester, take the fight to the housing minister with a street stall in Croydon next Saturday 7th , and other action. Get in touch to join in! The Housing and Planning Act grows weaker and weaker but still we must fight to axe it once and for all. On Monday 21st November 2016 the Government scrapped a key feature of the Housing and Planning Act 2016; the ‘Pay-To-Stay’ tax on so called ‘high-income’ social tenants. One down – More to Go. 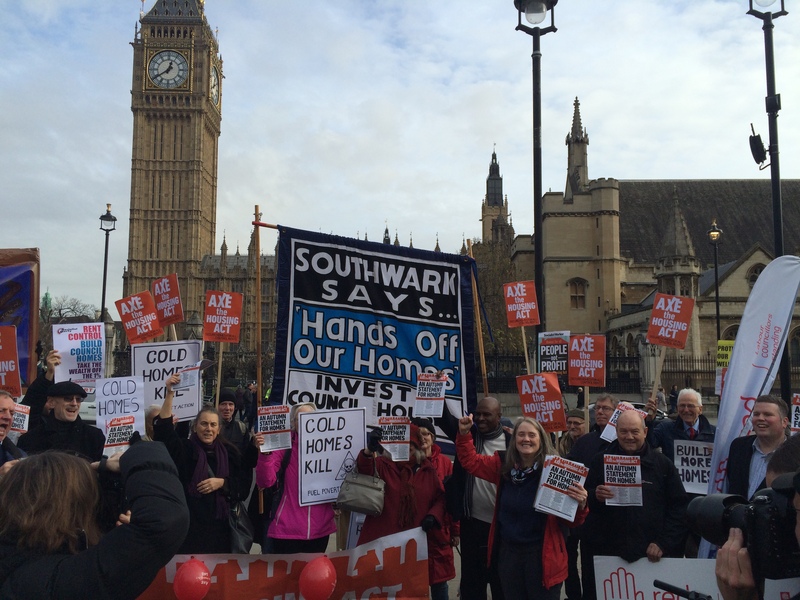 Thank you to everyone who supported our Autumn Statement for Homes Protest at The Houses of Parliament on Wednesday 23rd. Together we can Axe The Housing Act. Featuring Piers Corbyn who presents a simple and straightforward list of measures that would end the housing crisis and let everyone have access to decent secure housing. In episode five we hear about the onslaught on people of different policies being brought in at the moment, including Universal Credit, the Bedroom Tax and the Housing & Planning Act and next we have Barry Duckett – the Chair of his local TRA in Southwark and member of the Rotherhithe Area Housing Forum. Do you have a story to share? Get in touch with us. The Housing Act is fundamentally unfair, unworkable and must be repealed. We need to replace it with a national housing strategy that helps create a more just and equal housing future based on rent controls and secure homes for all. Our Autumn Statement gives some ideas for how we can do that. We welcome other suggestions and contributions. Investment in council and other really affordable homes for rent is vital – we need more not less. Investing in council housing and other social rented homes will reduce housing need and help take the heat out of the housing market. Building homes will boost the economy and can create decent, well-paid jobs and apprenticeships. The Trades Union Congress (TUC) has shown that government investment in new, ‘green’ housing is good value for money, with the economy gaining £3.50 for every £1 invested. 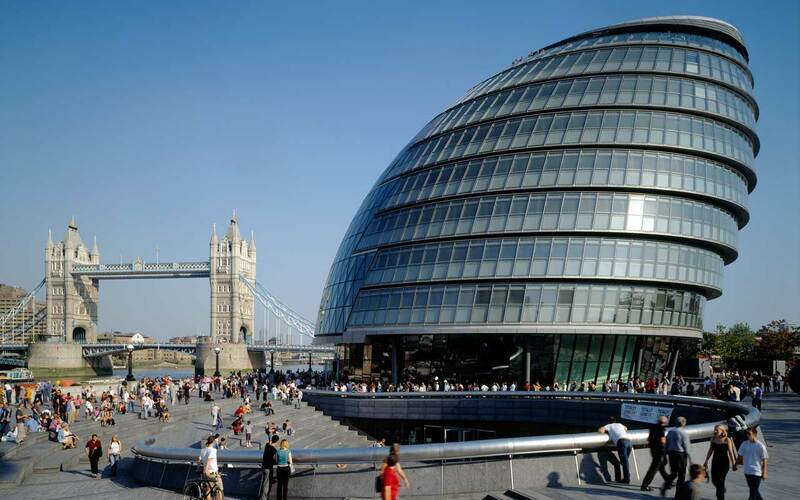 The Housing and Planning Act attempts to redefine social renting as ‘emergency’ or ‘temporary’ housing, by ending secure tenancies for council tenants and imposing means testing. This is no way to sustain stable, diverse and cohesive neighbourhoods, rural and cities. We need genuine mixed communities with homes forthe people who clean hospitals and deliver babies, work in factories, teach and assist in classrooms, grow and cook our food and make our coffee, deliver the post and drive buses and trains. A decent,secure, affordable home should be a right, not a time-limited privilege. Our Autumn Statement seeks to protect permanent tenancies for council and housing association tenants and calls for more security, and the scrapping of six-month Assured Shorthold Tenancies, in the private sector. Less security of tenure means more social cleansing. Entire neighbourhoods are being stripped of their vital social networks and character as people on average and low incomes are priced out. Often this happens under the bogus guise of ‘estate regeneration’. Our Autumn Statement calls for the suspension of estate demolition programmes and investment in new and existing council housing, without strings attached. We need to redirect funding into bricks and mortar, instead of using public money to support high rents and house prices through curren tsubsidies and tax breaks to developers, financiers and landlords and to ‘StarterHomes’. Local councils are currently prevented from investing in the homes we need by accountancy procedures that stop them using all the money from Right to Buy sales, borrowing at providential rates and using the full proceeds of rents. Contrary to the myth peddled by politicians and the media, council housing is not subsidised – the biggest subsidies go to landlords (see Shelter report, and for more detail John Hills 2007). Instead our Autumn Statement says we should allow councils the freedom to invest to build and maintain homes that meet need. Private property developers are profiteering from the housing crisis. They use secret ‘viability assessments’ to get planning permission and build homes few can afford, often bought by investment companies, and many then left empty. Our Autumn Statement calls for the full publication of viability assessments, demands that all new housing developments meet local housing need and that public land is used to launch a national programme of new council house building. The New Economics Foundation has identified an initial 10 plots of publicly-owned land that could provide 4,631 new homes. Other land owned by us – such as the Holloway Prison site in north London – has the potential to make a real contribution towards solving the housing crisis for this and future generations. The misuse of public land and ‘land banking’ by private developers show we need more democratic control over planning decisions, not less as the government intends. Our Autumn Statement demands the full restoration of planning powers to elected local councillors and the enforcement of existing rules to ensure new housing development meets local housing need. Housing decisions and services work better when they’re accountable to local people. 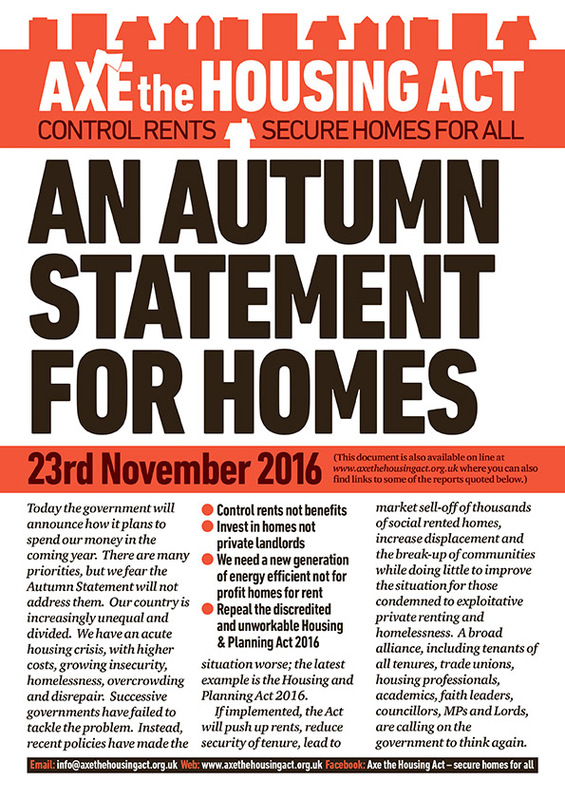 Our Autumn Statement calls for genuine consultation and opportunities for participation for tenant and resident organisations. 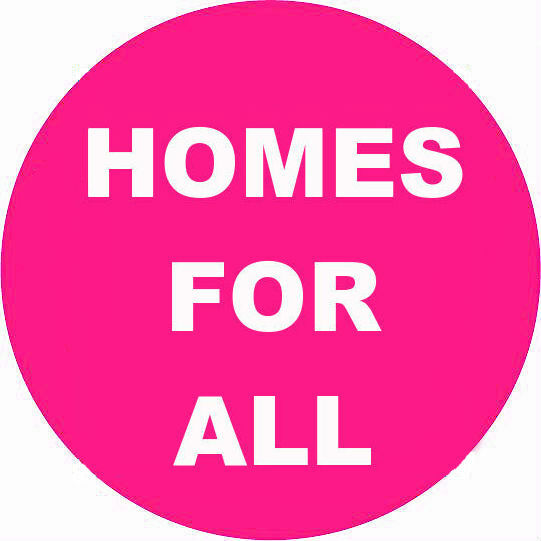 We need housing rights for all, including particularly fo rthe homeless and for Gypsies and Travellers who have seen them taken away over recent years, including under the Act.We back the United Nations Declaration of Universal Human Rights which enshrines the right to adequate housing, including protection from arbitrary eviction, demolition and interference, freedom of movement, security of tenure and equal and nondiscriminatory access to adequate housing. 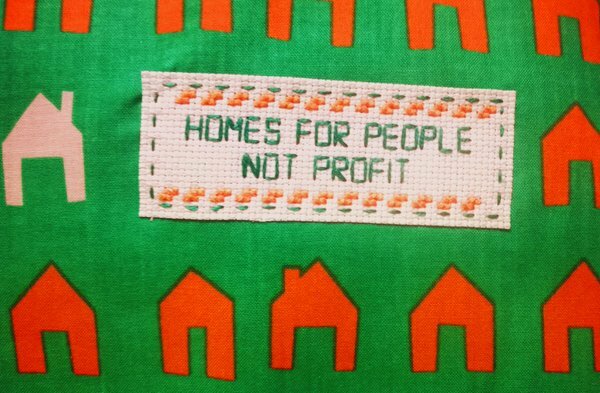 Housing availability and costs are now a major workplace issue, which is why more trade unions are campaigning for a new approach to housing policy. Too many workers now have to spend well over 30% of their pay on rent or housing costs, or have to spend lots of time and money on long commutes. Even the CBI says that housing costs are having a negative impact on business, the economy and society. Our Autumn Statement calls for a new definition of ‘affordable’ housing based on what two-thirds of people can afford at a maximum one third of net income. Repeal the Housing & Planning Act 2016. Regulation of private renting to include controlled rents, secure tenancies and an end to no-fault and retaliatory evictions. Join our Protest at The Houses of Parliament on November 23rd 2016, 12pm. Watch episodes two and three of our series ‘VOICES OF THE HOUSING CRISIS’ featuring Rebecca Sawbridge, a resident of Dover and Peter Forrest, a council tenant from Kent.